It may be over in Oz/NZ but there is still one day of Chanukah to celebrate in L.A….and an Australian rabbinical student has wowed the glamour city with his Menorah motor-bike. 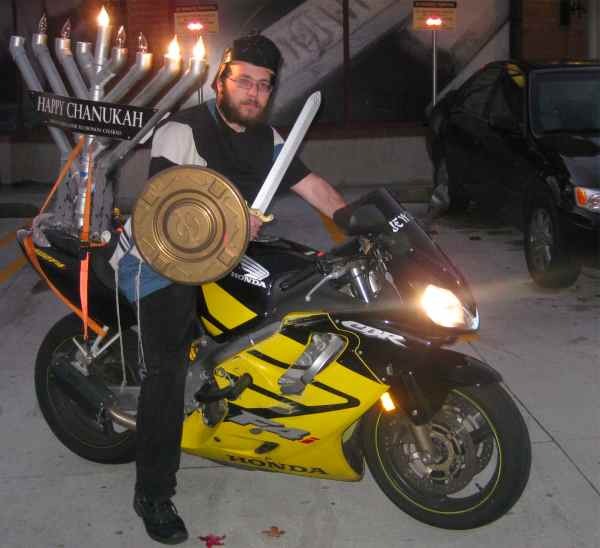 Mendy Kaye, from Sydney Australia, spread the light and warmth of the menorah to the streets of Los Angeles in an innovative way, He strapped a 3 foot menorah to the back of his sportbike motorcycle. Mendy, the son of a shliach of the Lubavitcher Rebbe, in Sydney, said “There are so many Xmas trees and lights in LA, that some Jewish people feel left out. I wanted to bring the symbol of Chanukah to people in a way that they could really appreciate. A way that makes them feel proud of their Judaism”. Throughout Chanukah, Kaye organized many parties, led the parade around Los Angeles on the fifth night of Chanuka, and gave out menorahs to hundreds of appreciative Jews. He explained the story of Chanukah to all that would listen. The response to Mendy was overwhelming. Rabbi Steinberg, Senior Chaplain of Los Angeles County Sherriff’s Department said “I was concerned at first for the safety of Mendy, however, I observed people beeping their horns, screaming “Happy Chanukah” to him. I believe Mendy’s sincerity is his best protection”. Mendy Kaye, a young Rabbinical student, and teacher at the Jewish Educational Trade School, has won the hearts of Los Angeles Jewry, with his unique Aussie way of bringing Light to the city of lights, on the back of a motorcycle. 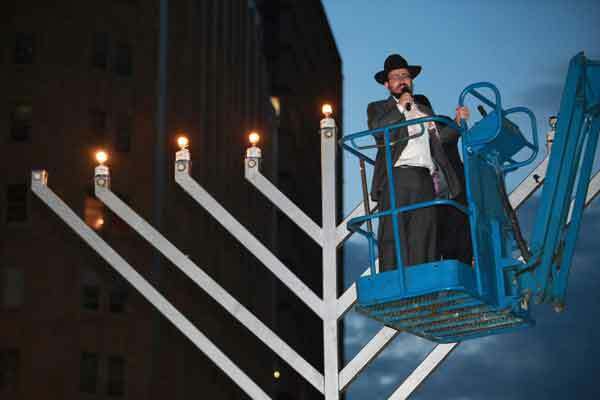 Meanwhile, back in Australia, Chabad took Chanukah to the general community with celebrations in Melbourne’s Federation Square, Brisbane and Sydney’s Martin Place where a cherry-picker was used to light the menorah.